Endoscopic ultrasound (EUS)-guided double bypass (EUS-DB) is a novel technique in the management of concomitant biliary and gastric outlet obstruction   . It involves the creation of both an EUS-guided gastroenterostomy and a hepatogastrostomy. We describe the first reported case in the literature (with video) of EUS-DB performed in collaboration with interventional radiology. A 54-year-old man with known locally advanced pancreatic cancer was referred for recurrent cholangitis and gastric outlet obstruction despite previous duodenal stenting and transhepatic percutaneous biliary drainage (PTBD). Endoscopy confirmed complete obstruction of the duodenal stent as a result of tumor tissue ingrowth. A decision was made to proceed to EUS-DB to optimize nutritional status, biliary drainage, and patient comfort ([Video 1]). Video 1 Successful endoscopic ultrasound-guided double bypass in collaboration with interventional radiology. A guidewire was introduced through the PTBD, traversing the enteral stent, and advanced to the jejunum. A 20-mm dilating balloon with an overlapping snare attached was then introduced over the PTBD wire and advanced across the enteral stent to the ligament of Treitz, where the balloon was inflated under fluoroscopy ([Fig. 1 a]). Overall, 500 mL of both saline and contrast was then injected percutaneously to dilate the small-bowel segment proximally to the balloon. 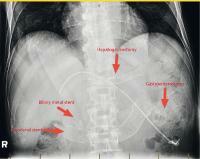 EUS-guided puncture of the balloon was performed transgastrically with a 19-gauge needle ([Fig. 1 b]). Bursting of the balloon confirmed successful puncture in the desired jejunal segment. A 0.035-inch guidewire was then advanced through the needle, grasped with the snare, and pulled through the percutaneous access, thereby creating wire tension on both ends of the wire. Track dilation was performed with a 4 mm dilating balloon. A lumen-apposing metal stent (15 × 10 mm) was then deployed under EUS guidance ([Fig. 1 c]). Contrast injection confirmed a patent gastroenterostomy. Fig. 1 Imaging studies. a Endoscopic ultrasound (EUS) view of the inflated balloon in the jejunum, distal to the obstruction site. b Fluoroscopic view of the EUS-guided needle puncture of the inflated balloon. c Endoscopic view of full deployment of the lumen-apposing metal stent. Attention was then shifted to the hepatogastrostomy. Under EUS guidance, a dilated hepatic segment III left intrahepatic bile duct was visualized. A transgastric puncture of the duct was performed with a 19-gauge needle, followed by the advancement of a 0.035-inch guidewire into the common bile duct ([Fig. 2 a]). The hepatogastrostomy track was then dilated using a 4-mm dilating balloon, followed by successful deployment of a 10 × 80 mm partially covered, self-expandable metal stent ([Fig. 2 b], [Fig. 3]). Fig. 2 Fluoroscopic view. a Transgastric guidewire coiled in the hepatic hilum. b The fully deployed 80-mm, partially covered, self-expandable metal stent forming hepatogastrostomy. Fig. 3 Post-procedural abdominal radiograph, showing all stents in place. A full, low-residue diet was initiated 48 hours post-procedure, with excellent tolerance. The PTBD was removed 3 days later. Bilirubin levels had decreased by more than 50 % at the 1-week follow-up. We describe the first reported EUS-guided double bypass performed in collaboration with interventional radiology. Combining endoscopic and interventional radiology techniques may enhance the safety and ease of this novel approach. However, further studies will be needed to validate this new approach. 3 Chen YI, Khashab MA. 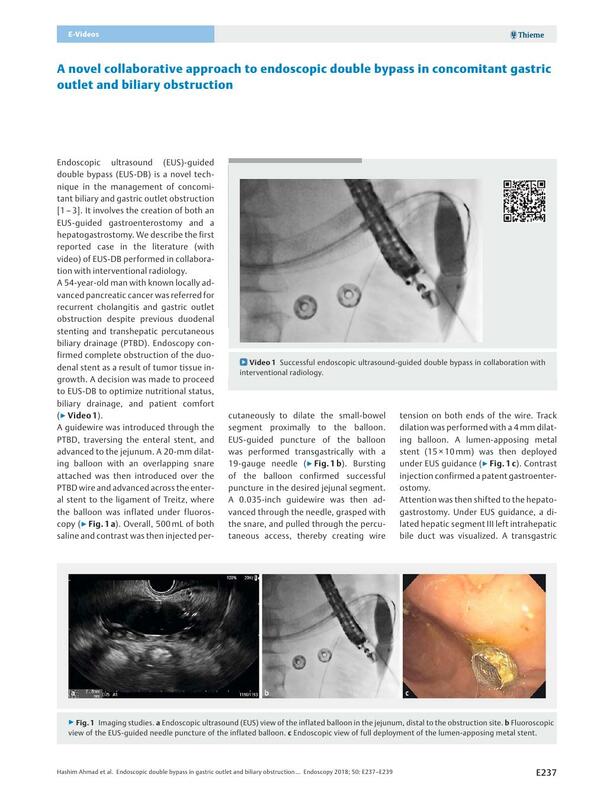 Endoscopic approach to gastrointestinal bypass in malignant gastric outlet obstruction. Curr Opin Gastroenterol 2016; DOI: 10.1097/MOG.0000000000000292.